Go to original pattern for design DROPS 149-34. 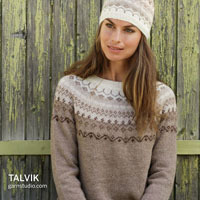 Knitted DROPS jacket with short sleeves worked sideways in ”Delight”. Size: S - XXXL. 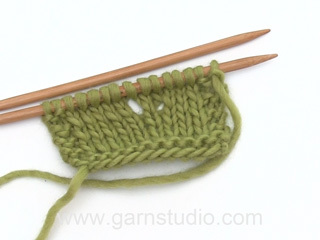 DROPS CIRCULAR NEEDLE (60 or 80 cm) SIZE 3.5 mm - or size needed to get 23 sts x 30 rows in stocking st = 10 x 10 cm. DROPS CIRCULAR NEEDLE (60 or 80 cm) SIZE 3 mm - for edges. * 4 ridges (i.e. 8 rows K), 4 rows in stocking st *, repeat from *-*. Inc 1 st by making 1 YO. On next row P YO when working in stocking st and K when working in garter st. Piece is worked in parts. The piece is worked back and forth on circular needle because of no of sts. Beg at the edge of sleeve, cast on new sts for front piece and work until mid front. Row 1 (= RS): 1 edge st in garter st, K until 1 st remains and work 2 sts in last st (= 1 st inc) = 88-88-87-87-85-82 sts. Row 2 (= WS): P with 1 edge st in garter st in each side. Row 3 (= RS): 1 edge st in garter st, K until 2 sts remain, 1 YO, K 1 (insert 1 marker in this st), 1 YO, K 1. Row 4: P all sts and YOs with 1 edge st in garter st in each side. Then work in stocking st with 1 edge st in garter st in each side while AT THE SAME TIME on every row from RS inc 1 st on each side of st with marker – READ INCREASE TIP (= 2 sts inc per inc row). 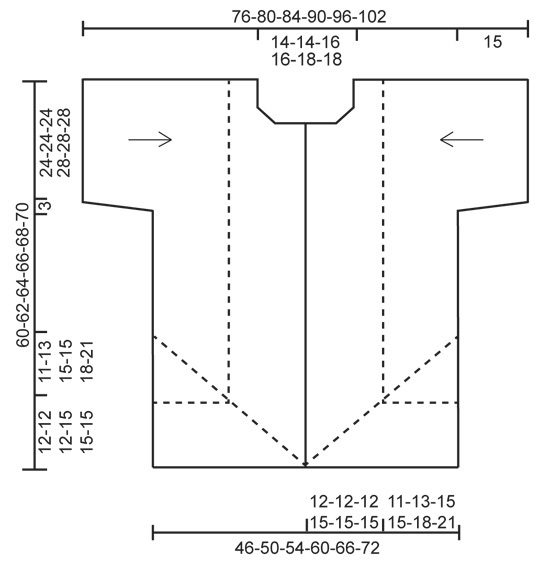 When piece measures 26-28-30-30-33-36 cm measured from the edge on sleeve at the longest (piece measures approx. 11-13-15-15-18-21 cm from where new sts were cast on), work STRIPE PATTERN – see explanation above, with 1 edge st in garter st in each side – NOTE: Continue inc on each side of st with marker as before. AT THE SAME TIME when piece measures 31-33-34-37-39-42 cm from edge of sleeve, cast off for neck on every other row (i.e. at beg of every row from RS) as follows: Cast off 12-12-12-13-13-13 sts 1 time and 1 st 2-2-2-3-3-3 times, then cast off 1 st every 4th row (i.e. on every other row from RS) 2 times in total. Continue with STRIPE PATTERN, 1 edge st in garter st in each side and inc as before until piece measures approx. 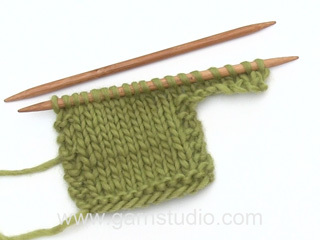 38-40-42-45-48-51 cm from edge of sleeve – adjust after 7 rows K (piece measures approx. 23-25-27-30-33-36 cm from where new sts were cast on and edge with STRIPE PATTERN measures approx. 12-12-12-15-15-15 cm). On next row from WS cast off sts at beg of row and to and with st with marker (= bottom edge on jacket) = approx. 122-126-132-134-138-142 sts remain on row. 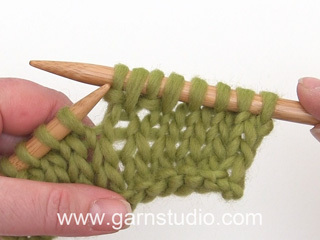 Switch to circular needle size 3 mm and work in garter st back and forth for 2 cm for band, then loosely cast off. Row 1 (= WS): 1 edge st in garter st, P until 1 st remains and work 2 sts in last st (= 1 st inc towards bottom edge) = 88-88-87-87-85-82 sts. Row 2 (= RS): 1 edge st in garter st, 1 YO, K 1 (insert 1 marker in this st), 1 YO and K the rest of row. Row 3 (= WS): P with 1 edge st in garter st in each side. Then work in stocking st with 1 edge st in garter st in each side while AT THE SAME TIME on every row from RS inc 1 st on each side of st with marker as on left front piece. When casting off for neck, cast off at beg of every row from WS (instead of RS) and cast off sts in bottom edge on jacket from RS instead of WS. In addition when band measures approx. ½-1 cm, cast off for 6-6-6-7-7-7 buttonholes evenly. Upper buttonhole should be max. 0.5 cm from neck edge, and bottom hole approx. 10 cm from bottom edge. 1 buttonhole = cast off 2 sts and cast on 2 new sts on next row over these sts. Work as right sleeve + front piece but when piece measures 31-33-34-37-39-42 cm, cast off for neck at beg of every row from WS as follows: Cast off 1 st 4 times in total. When sts in bottom edge have been cast off, approx. 134-138-142-148-152-156 sts remain on needle. Work 1 ridge in garter st and loosely cast off (= mid back). Cast on and work as left sleeve + front piece but cast off for neck as on left back piece (and cast off at beg of every row from RS). Sew the back piece tog mid back inside cast-off edge. Sew shoulder seams inside 1 edge st. Sew underarm and side seams in one inside 1 edge st. Sew on buttons. Pick up from RS approx. 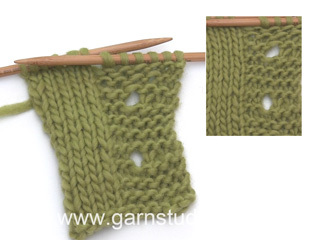 94 to 116 sts around the neck on circular needle size 3 mm with Delight. K 4 rows (1st row = WS) and loosely cast off with K from WS. Er det rigtig forstået, at den første pind efter de 4 pinde retstrik, er på retsiden og at det er ene retmasker der skal strikkes? Hej Anne Marie, den første pind efter de 4 pinde retstrik, strikkes således: Skift til rundp 3,5 og strik næste p således fra retsiden: 1 kant-m retstrik, 2 m glatstrik, * 4 m retstrik, 4 m glatstrik *, gentag fra *-* totalt 6-6-6-7-7-7 gange og afslut med 4 m retstrik, 2 m glatstrik og 1 kant-m retstrik. Fortsæt mønsteret således.God fornøjelse! Bonjour Mme Woro, pour une transition plus douce entre les pelotes, commencez la nouvelle par la même couleur que la fin de la précédente. Les différentes parties se tricotent en vis à vis, les rayures seront donc parallèles à l'assemblage. Bon tricot! Liebe Moni, wir haben uns bei diesem Modell entschieden, die Umschläge nicht verschränkt abzustricken, damit dekorative Löcher entstehen. Toll wann soll ich das alles stricken? Fint snitt og herlig farge. Passer til alt.